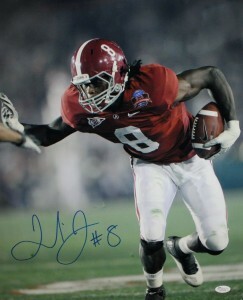 Julio Jones was one of the best overall athletes and top receivers in the 2011 NFL Draft. 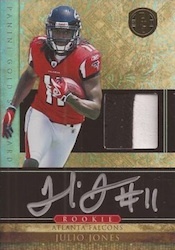 His obvious talent, combined with his college success at Alabama, has continued into his NFL career and made Julio Jones cards a hot commodity among collectors. Although injuries are a valid concern, Jones has proven to be among the NFL's elite wide receivers when healthy. Collectors should have few reservations about investing in this dynamic young player. Following a stellar career at the University of Alabama, Julio Jones was the sixth overall pick by the Atlanta Falcons in 2011. Strong seasons in 2012 and 2014 paved the way for his ascension to the top of the receiving world and put him squarely on the collecting radar. Although wide receivers don't generally enjoy the same hobby interest as quarterbacks or running backs, Julio Jones cards have long-term potential. Still young, Jones should enjoy a very productive career and remain a top WR for several years. 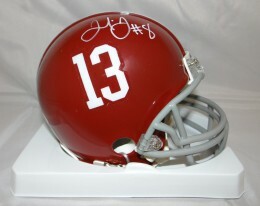 His rookie cards are found in 2011 products and there are plenty of choices for collectors. 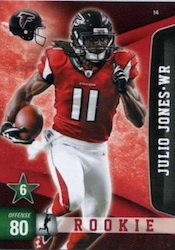 A few key Julio Jones rookie cards are noted below and his full rookie card checklist can be seen by using the tab above. The simple design of Crown Royale makes use of a lot of white, which helps highlight the image of Jones over a large jersey piece. The card also features a nice on-card signature. One of the most attractive Julio Jones cards, the 2011 Panini Gold Standard card is hard-signed with a small jersey swatch. The higher print run keeps it from elite rookie card status. 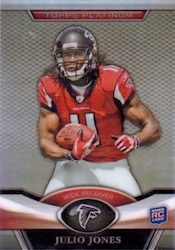 JULIO JONES 2011 DONRUSS ELITE AUTO RC #3 49 RARE FALCONS ! 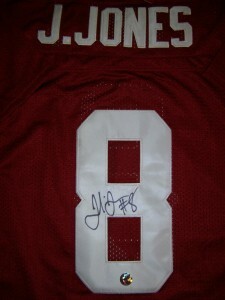 2011 Press Pass Authentics Julio Jones Head Of The Class RC Autograph 19 25 WOW! 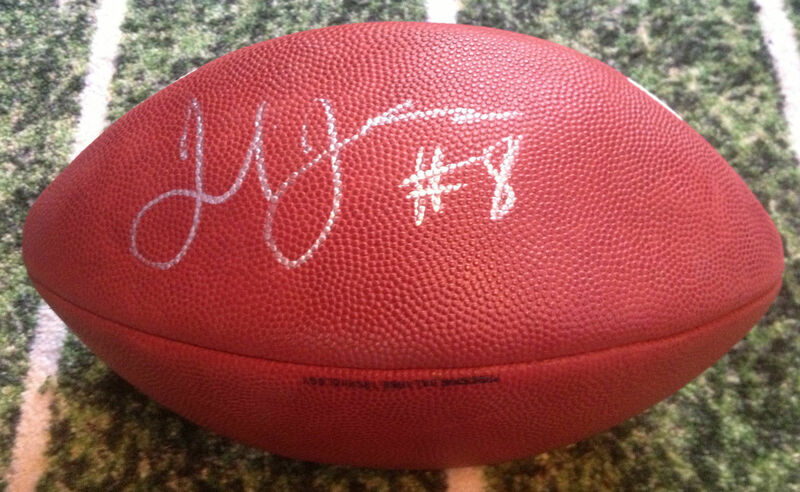 Below you will find an example of what Julio Jones's authentic signature looks like. This can be used as a first point of reference for determining the legitimacy of autograph memorabilia, but is not a substitute for having your items authenticated by a well-respected professional autograph authentication company. Some of the trusted sources within the sports memorabilia market include the following companies: PSA, JSA, Steiner, Tristar and Mounted Memories. Click on any of the images below to view full size photos. Signature is defined by five distinguishing marks. The first letter "J" consists of a closed loop at the bottom with a flat top and a short diagonal topping line. The pen stays on the paper into a narrow "l", usually with a closed loop. The pen lifts to dot an implied "i." The second "J" has a more rounded bottom loop. The inscription "#11" is usually present. 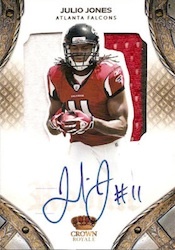 Is it true Julio didn’t sign a lot of the rookie cards that upper deck had sent him? Making the upper deck rookie cards more scarce?